Here’s a rare bit of good news for a Friday: scientists in Australia have found that eating red meat can halve your risk of depression. Researchers at the Deakin University, Victoria, found that those consuming less than the recommended amount of red meat were twice as likely to be diagnosed with depression or anxiety than those who got their fill. Of 1000 Australian people surveyed, the study also found that factors like general health, physical activity and smoking had no effect on the link between red meat and mental well-being. Still, that’s not to say that you should be eating cheeseburgers at every meal. For a seasoned approach to this high-steaks game, read our guide to the healthy way to eat meat. There’s some bad news for your steak: it might not be that good for you. That’s according to a study of 1.5 million people by the Mayo Clinic in Arizona that found avoiding red meat for 17 years can extend your life by another four years. And those findings aren't a one off. A Harvard Medical School study of 120,000 people over a 28-year period found eating one extra hunk of unprocessed red meat every day, roughly the size of a deck of cards, is associated with a 13% higher risk of “total mortality”. An additional daily serving of the processed sort – a sausage, or two slices of bacon, say – was responsible for a 20% increase. It seemed red meat’s number at the butchers of health was up. But haven’t we always advocated red meat as a good thing? Is steak not a muscle-building man-food without equal? And what of all the iron, zinc and B vitamins that constitute a vital part of a balanced diet? Is there some dietary scaremongering going on or do we really have to give up bacon? 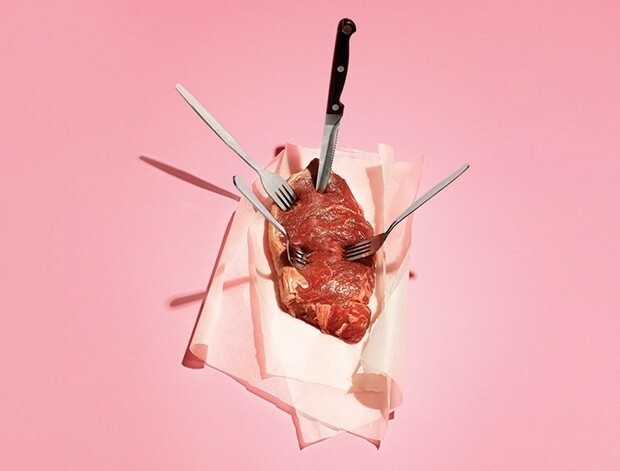 We asked top experts in the fields of health and nutrition to cut through the statistical gristle, find out the truth about the original man food, and tell you how you can feast on red meat in a fashion that's as good for your health as it is for your dinner. The Harvard study certainly shows an increased incidence of heart disease in red meat eaters. Regardless of the specific cut of meat you choose or how you eat it, the levels of saturated fat and cholesterol mean that regular consumption makes you more susceptible to high blood pressure and more serious cardiovascular complications as a result. But their study group was American. The United States Department of Agriculture puts their country’s daily red meat consumption at 85g per capita per day, but the UK average intake is closer to 70g, judged safe by the Scientific Advisory Committee on Nutrition. So don’t worry too much about a bacon sandwich on a Sunday. While most studies and guidelines are based on daily consumption, it is far more realistic to manage your intake on a weekly basis. “The World Cancer Research Fund states that you shouldn’t be eating any more than 500g in a week,” explains nutritionist Dr Sarah Schenker. To put that into context, you can put away an 8oz steak (227g) a 4oz pork chop (113g), 2 pork sausages (50g each) and a portion of chilli con carne with beef mince (60g). Which is plenty for one week – or one hell of a mixed grill. But it’s how you consume your fleshy quota that matters to your health. As with booze, as long as you don’t exceed your limit and try not to make a habit of chucking it back every single day, you’re fine. “If you have a big steak on Saturday night that doesn’t mean you can’t have any red meat for the rest of the week,” says Schenker. “But I wouldn’t recommend you eat red meat every day, even in small quantities either.” Enjoy responsibly – but most of all, enjoy. 1) 500g is the cooked weight. When buying raw, it can be closer to 600g/650g, winning you an extra serving on the plate over the week. 2) Split your red meat consumption equally over three meals, with a day off in between to get the most from your quota in the safest way. However, it is the richest natural source of the muscle-building nutrient creatine – a nitrogenous organic acid stored in the cells in your muscles and used to fire high-intensity contractions. More creatine in your diet means more oxygen to your muscle fibres for increased power during workouts. The result? You beef up faster. Just don't listen to the bro-science touted on bodybuilding forums, Williams warns. Red meat cannot be the cornerstone of your creatine intake without your consumption exceeding the high-risk levels outlined by the Harvard scientists. Refuel with oily fish, as well as beef, to keep you creatine levels nicely topped up – a similar-sized serving of salmon or herring contains as much of the powerful nutrient as any burger. 1) The perfect post-workout meal is a ratio of 9:7:3 (carbs:protein:fat) – a thin slice of creatine-rich venison between two slices of wholemeal bread. 2) Vary your sources when on a high-protein diet to save money. Tuna comes in cheapest at 40g per can, then milk at 30g per litre and you get 7g in every egg. Compared to chicken, turkey or fish, red meat is not the leanest protein on the supermarket shelves. Your average rib-eye steak, for example, contains 37g of total fat, 15g of which is of the saturated kind that the Harvard Study highlights as responsible for the prevalence of heart disease among their study subjects. You can keep the fat content down, though. “A fillet steak will have very little fat on it, regardless of where you buy it or how it’s cooked,” says David Lishman, master butcher of award-winning Yorkshire butchers Lishman’s of Ilkley. “It comes from an area of the animal that does very little work, so it’s one of the most tender and leanest cuts there is.” Sirloin, too, cuts a slim figure at only 2g of sat fat, and what marbled fat remains tends to render out during cooking. Whichever cut of whatever meat you choose, trimming away as much of the visible fat before you cook it is the best way to reduce the saturated fat content of your meal. You don’t need a masterclass in butchery, just pop your meat in the freezer for twenty minutes. This will harden the fatty tissue slightly, making it far easier to slice away from the meat quickly and neatly. 2) The fat content of minced meat, even ‘lean’ varieties can vary by up to 35%. Buy standard packs and blot/pour away the fat while it cooks. The flavour of any food is made up of an enormously complex combination of chemicals. Red meat is no exception. “There are literally hundreds of different compounds that contribute to the aroma and taste of a piece of beef,” says Dr Victor Kuri of the School of Biomedical and Biological Sciences, University of Plymouth. This is why a lot of more expensive beef will say it has been ‘dry-aged’ – hung in a fridge over a period of time, from a few days to a couple of months. The process loosens the connective tissue, which tenderises the meat for a better taste and speeds up the digestive process to get the nutrients to your muscles faster. Younger animals – pork, lamb and veal – do not take well to ageing, as they lack the fat marbling needed to prevent the meat from becoming rotten, so there is very little benefit in shelling out. As for beef, the vast majority of the tenderisation takes place in the first seven to 10 days. Anything aged beyond that point is a waste of your money. 1) Marinate cheaper cuts of beef in lemon juice for 30min before cooking. It breaks down connective tissue, making it more tender without adding any fat. 2) Vacuum packed steaks can be ‘wet-aged’ in your fridge for five days. The natural enzymes will tenderise the meat but trim off any discolouration before cooking. Keep the levels of monounsaturated fat down once it’s actually in the pan by using a griddle, which avoids having the meat resting in it’s own fats or oils. The healthiest oil is extra-virgin rapeseed oil, which has the lowest concentration of saturated fat. “Just brush both sides of the meat before you cook it, rather than drizzling oil all over the pan and the meat,” says Benson-Smith. 1) To make sure the pan is hot but not smoking, splash water onto it. When it bubbles, then evaporates, it’s ready. If it’s too hot it will steam off straight away. 2) Brush with an equal mix of extra-virgin olive oil, rapeseed and canola. The canola oil increases the smoking temperature of the more flavoursome olive and rapeseed. The confusion over pork has its roots in the ’70s and ’80s, when health concerns over red meat started to emerge. The pork lobby made great efforts to brand it as ‘the other white meat’, as it turns a pale colour when you cook it. “The reason it looks lighter than beef is down to the concentration of myoglobin, an oxygen-storage protein found in muscle,” says Dr Orla Kennedy of the Department of Food and Nutritional Sciences at the University of Reading. “It’s a pigmented compound which turns darker when heated and occurs in greater concentration in the slow-twitch muscles that are used for extended periods of activity, such as standing or walking.” Cows are bigger and have more muscular legs, so have more of the pink stuff. Simple as that. While pork is officially a red meat, it’s nutritional qualities mean it sits somewhere between fowl and beast. Pork tenderloin compares extremely favourably with white protein sources, with 32g per 100g to chicken breast’s 33g, while it’s ‘redness’ means a single pork fillet provides iron, zinc and 50% of your RDA of thiamine, a vitamin which can assist recovery after exercise. Just pass on the scratchings. Pork is the red meat that will most commonly be found in the processed form that ramps up your risk of ill health, and cured sausages, such as salami and chorizo, are extremely high in the nitrates and nitrites with a firm link to bowel cancer. So swap porky snacks for one weekly roasted treat. Then pig out. 1) Opt for tenderloin mid-week. It can be roasted in the oven (220°C) in only eight minutes for a quick hit of low-cal protein. 2) Figure cold-cuts into your consumption calculations. Even the ‘finest’ quality supermarket ham still ranks as processed meat by cancer authorities.